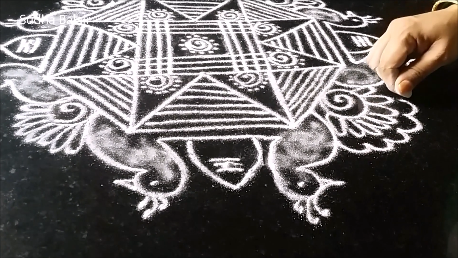 The theme is using the Vel ( a divine spear held by Lord Murugan ) and Mayil ( Peacock , vahana of Lord Shanmuga ) in a padi kolam. The pics below show the steps. 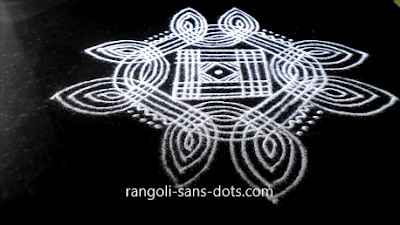 It can be drawn for Sasti or Tuesday too . 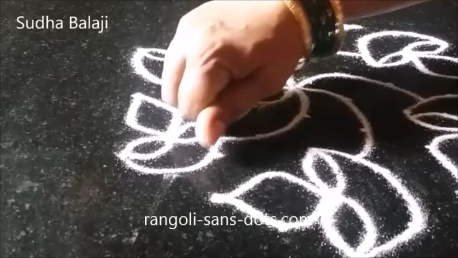 First things first . 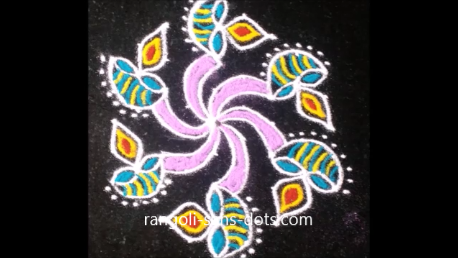 Deepam kolam or diya rangoli designs are very popular during Karthigai Deepam which is also the festival of lights, one more Diwali for Tamil Nadu. 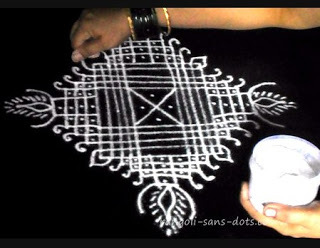 The kolam is 11 to 1 ner pulli kolam . 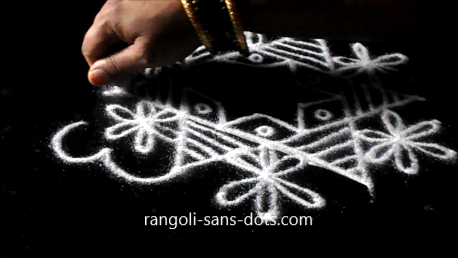 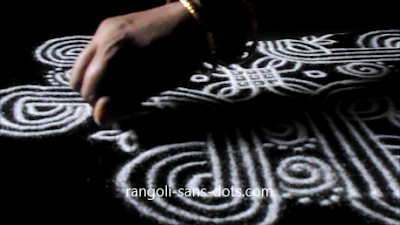 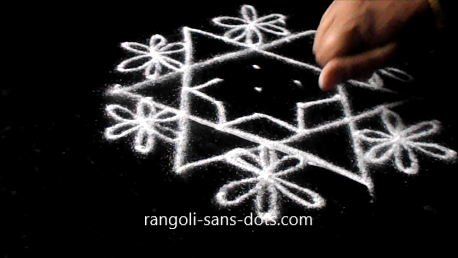 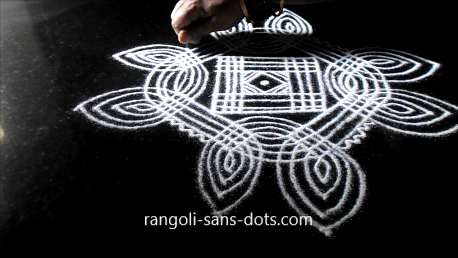 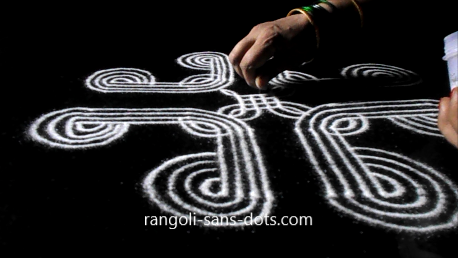 The images should clearly explain the steps needed to draw this kolam for the festival , I think so. 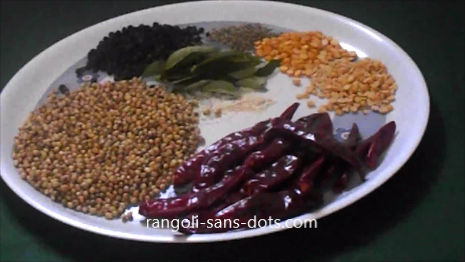 In the morning , we should prepare festival related recipes or kalyana samayal. 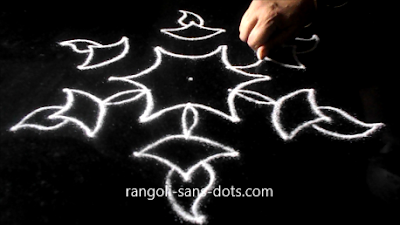 The previous day we can clean the puja room , draw an ezhai kolam with kaavi border . 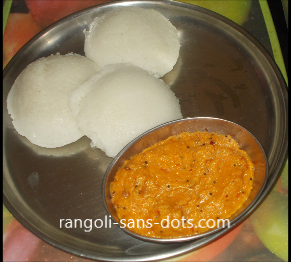 In the evening prepare puffed rice ball ( nel pori and aval pori urundai ) any sweet ( kesari or payasam ) with appam . 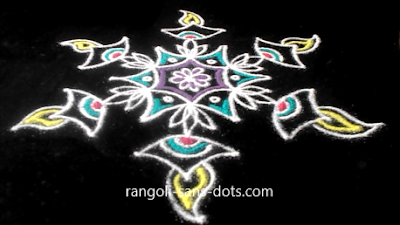 We can also offer coconut , fruits , betel nut and betel leaves. 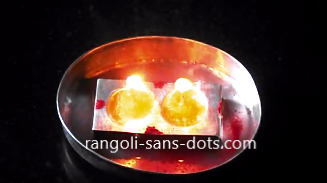 All the lamps that we use regularly for Puja particularly kutthu vilakku is to be cleaned , apply sandal paste , haldi and kumkum , offer flowers and light after placing five cotton wicks and filling the lamp with oil. 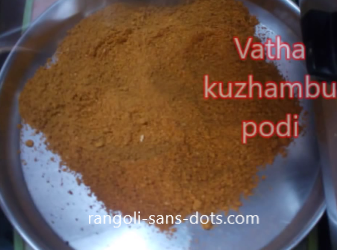 Perform Puja to the kuthu vilakku and to the deities also and offer naivedyam. 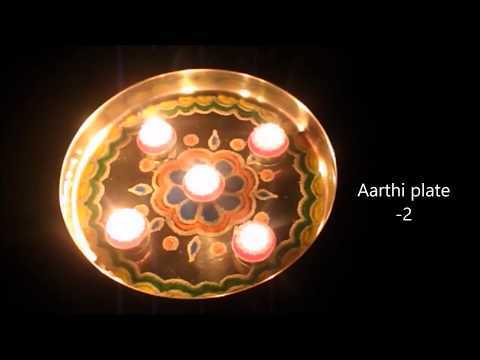 Pray in the direction of Thiruannamalai Deepam and light the agal vilakku or earthen lamps . 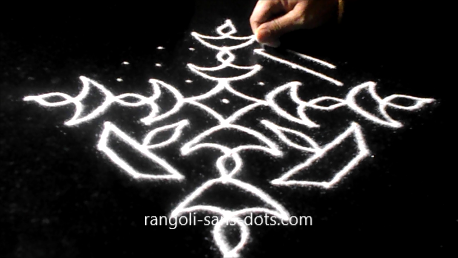 It is in our tradition to buy a few new agal vilakku every year. 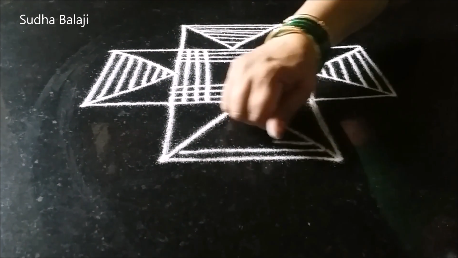 All the agal vilakku are filled with oil , cotton wicks are placed and apply kumkum on all four sides. 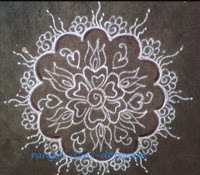 Place the lamps in the Puja room , around the kolam at the entrance and in other places inside the house that we wish to decorate. 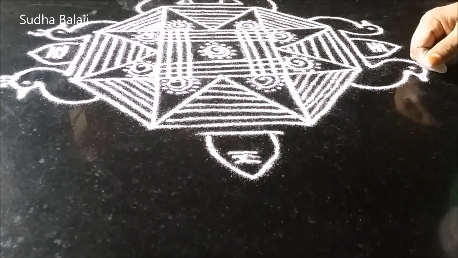 It is our tradition to draw a beautiful padi kolam or any other kolam at the entrance. We can fill with colours as we do for some festivals like Pongal. Dissolve one part jaggery in water. 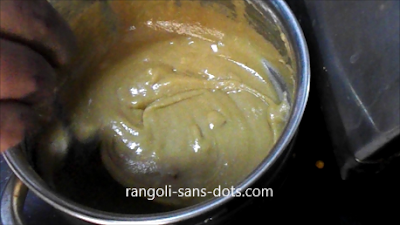 To this add one part wheat flour and 1/4 part rice flour. 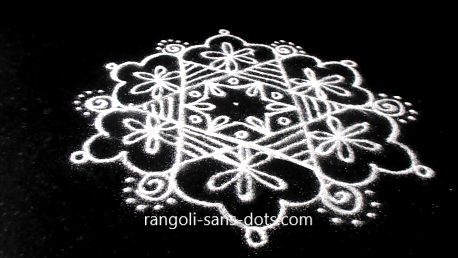 Add cardamom powder and chopped coconut. Fry in oil. 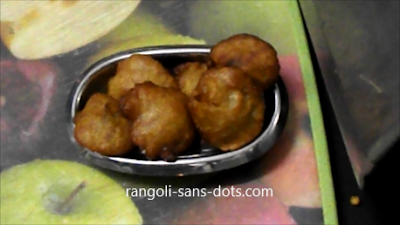 Wheat appam is ready for festival recipe. 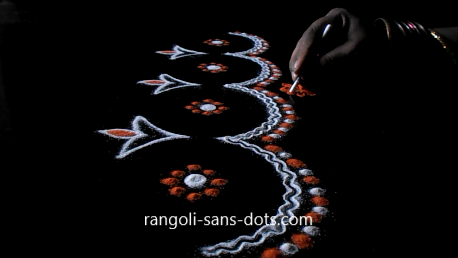 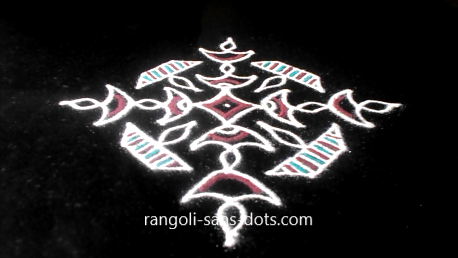 A different and unique rangoli for Karthigai Deepam which is similar to Diwali festival , the theme being diyas or deepam . This rangoli drawn by placing 4 CDs so that they touch each other. 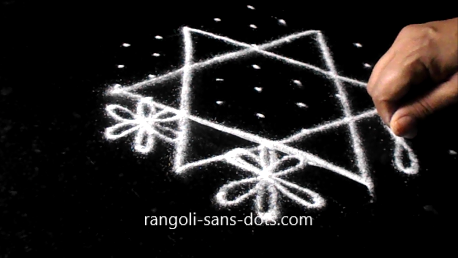 Then following the steps given in the images , the upper deepam patterns and the lower semi circular patterns are formed. 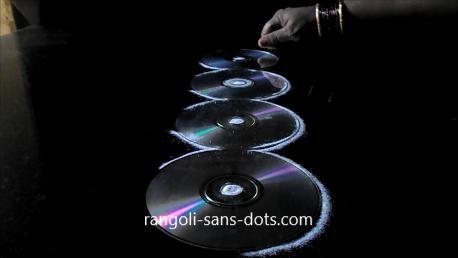 A dot with white rangoli powder is placed in each of the holes at the centre of the CDs around which we place orange dots to get the floral design at the centre. 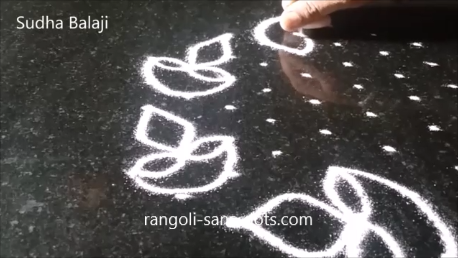 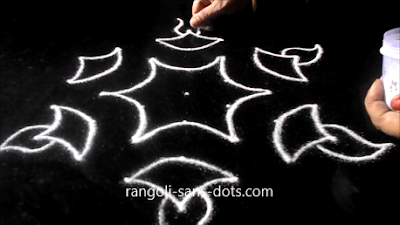 For additional decoration a floral design is formed between the second and third patterns using the cotton bud rangoli making technique. 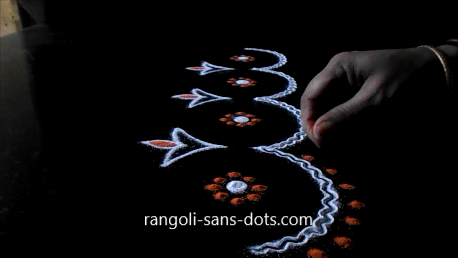 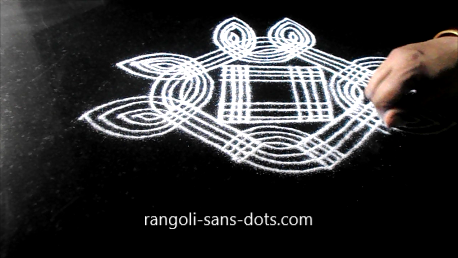 A traditional line rangoli design for Karthigai Deepam festival . We usually use 2,4 or 5 lines in padi kolam designs ( There is a school of thought that feels that the number of line should be even , however in our family we use 4 or 5 lines and rarely 2 lines ). 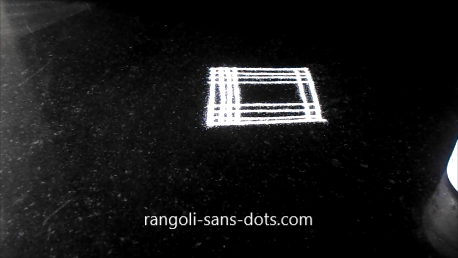 So using 4 lines form the basic square pattern that is invariably found in padi kolam designs . 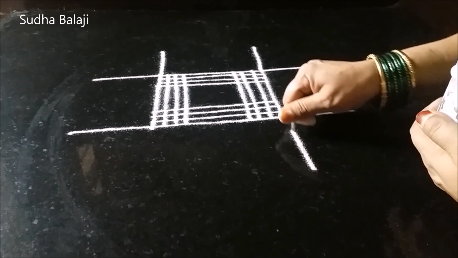 Next draw four sets of lines inclined as shown in the second image and touching the edges of the square. Now connect the adjacent lines with curved lines at the top and bottom. 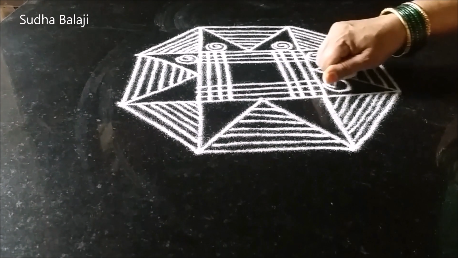 We can touch the square with these curved lines , we can intersect or we can draw such that the outermost line is outside the square. 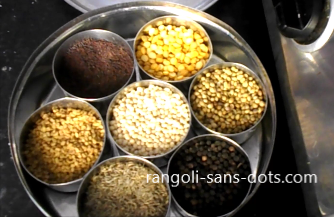 What ever we do we have to maintain uniformity on all four sides. 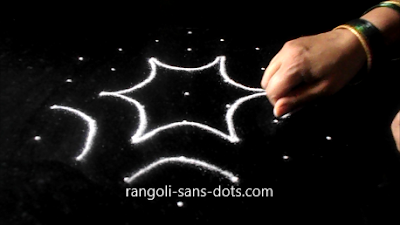 Now complete the kolam with four near elliptical lines as shown in the next image. 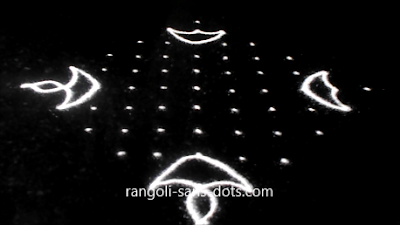 We should decorate the central space with decorations. 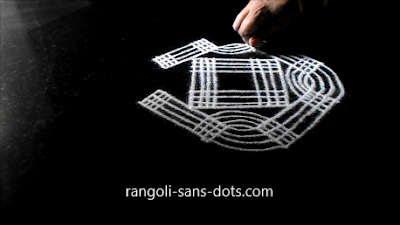 Usually I draw two diagonals and place dots inside. 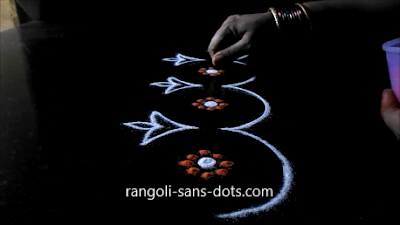 Further decorations are according to our imagination. 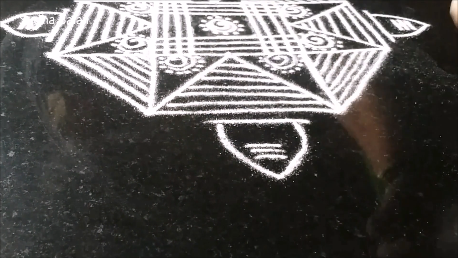 Draw a kaavi border or fill with some colourful lines here and there to complete the padi kolam for Karthigai Deepam festival. 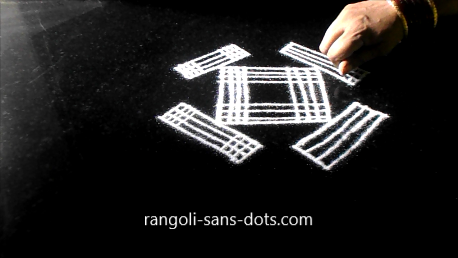 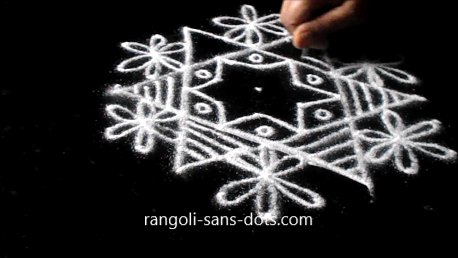 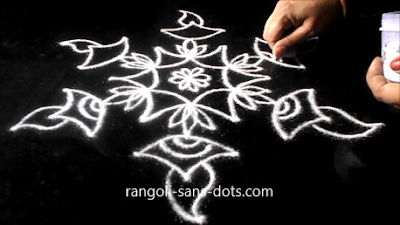 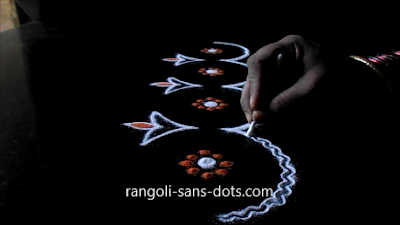 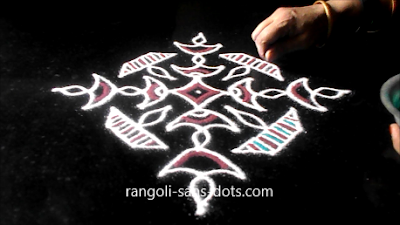 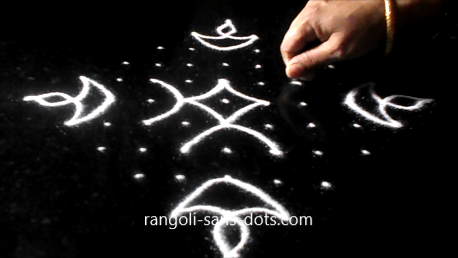 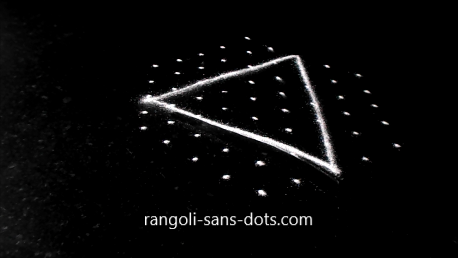 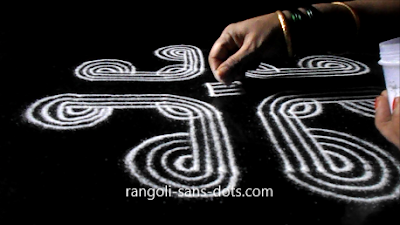 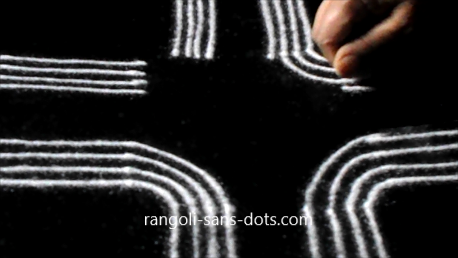 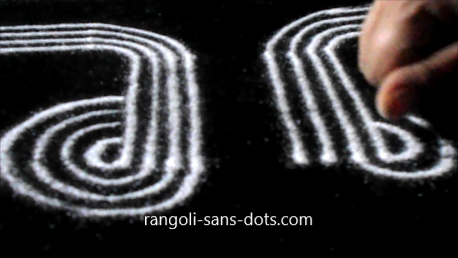 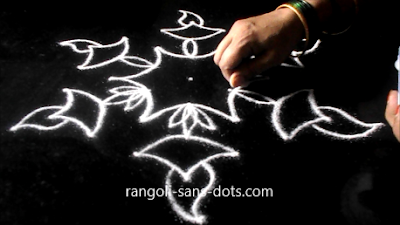 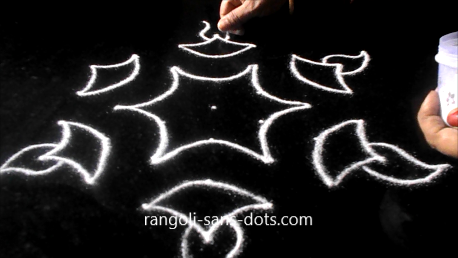 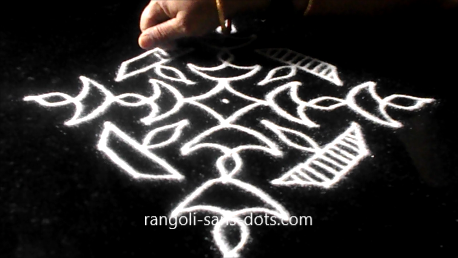 The next kolam after a different rangoli and padi kolam is a kolam with 9 by 5 dots pattern. 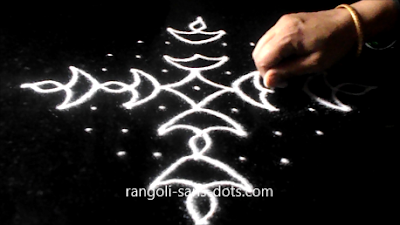 Instead of the usual deepam theme , I have tried a simple kolam that can be drawn for this festival. The images should help. 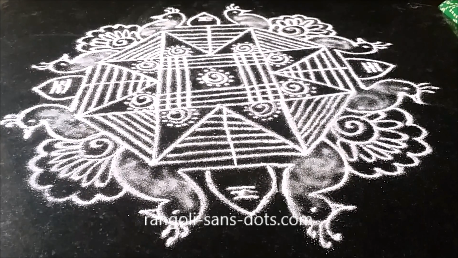 This is slightly different from the classical and traditional padi kolam . I have given lot of images for this kolam so that it will be easy to learn. The idea is we should practice to get lines as thin as possible , the thinner the lines the more beautiful the kolam will look. Instead of starting with square base as we do for most padi kolam , this kolam has two sets of four lines on four sides. 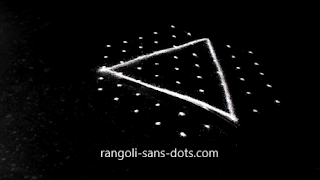 Then they are connected. This leaves the gaps at the centre and between the arms. 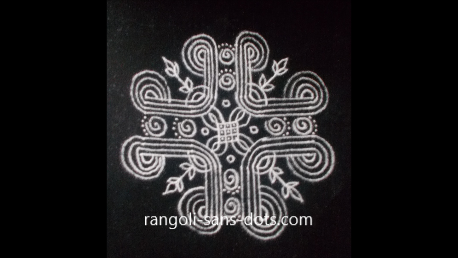 The centre is decorated with a small square and that is connected to arms. 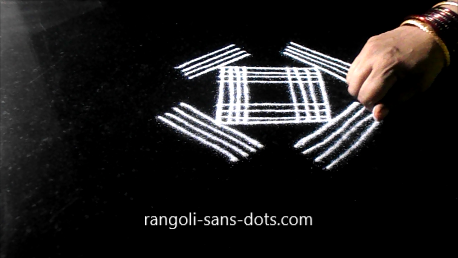 The gaps can be filled with patterns of our choice. 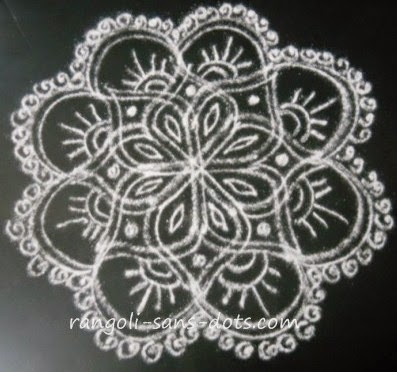 This is a simple kolam with 9 to 5 dot pattern. 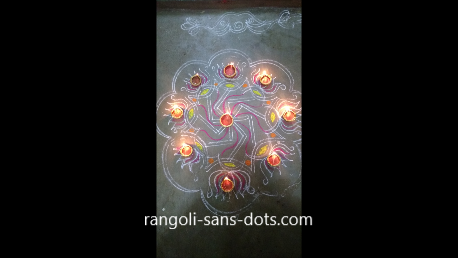 We get deepam or lamp patterns in the periphery with the jyothi pointing tangentially , the dots at the centre are used to connect all the lamps so we get a circular deepam design that resembles the wheel of bicycle ! 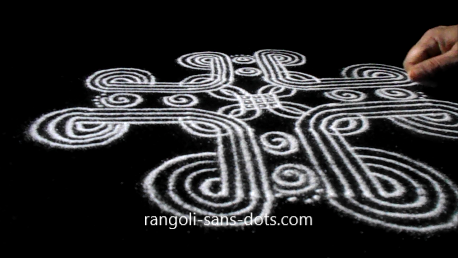 A double line kolam , I drew for the festival decorated with lamps. 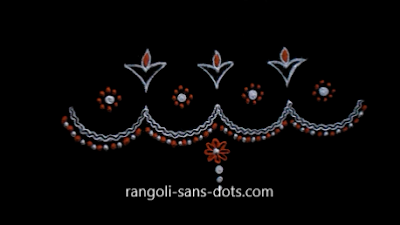 simple ones. 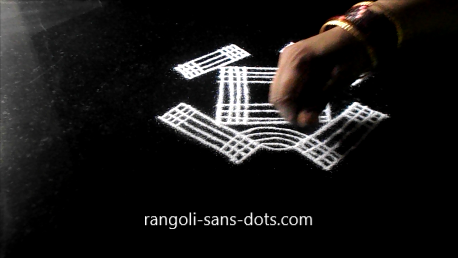 apt for beginers.